Kansas has always experienced severe weather events. But as average temperatures rise, due in part to heat-trapping pollution released from fossil fuels, these severe weather events are predicted to become more extreme. That means periods of drought will be more severe, while storms will be more intense and lead to greater flooding. This cycle of long periods of drought followed by intense rainstorms will also create a greater risk of wildfire on Kansas rangeland. So even though wildfire is a natural and regular occurrence, the conditions in the future will mean it’s more likely these fires will burn faster and hotter and cover more territory. 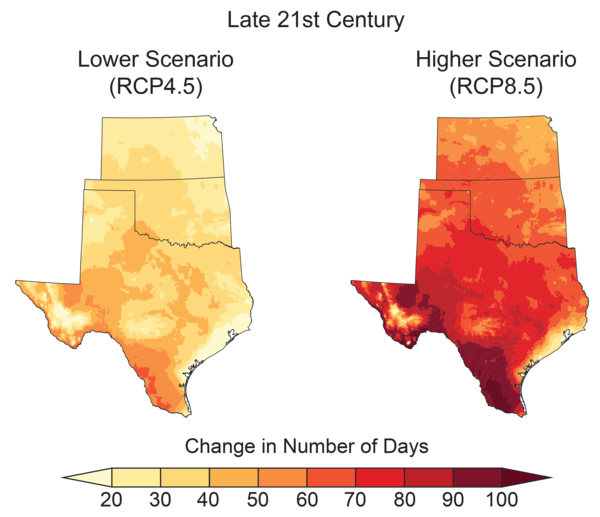 While past droughts have been driven by climate variability, or natural changes that fall within observed ranges, climate change is likely to make the problem worse. The report also predicts that by the end of the century, average temperatures in Kansas will rise as much as 4 degrees and the number of days above 100 degrees will increase by 20 to 30. Projected increase in the number of days above 100 degrees. degrees. The impact of those changes will create winners and losers, both in ecosystems and among cities and states. “Some plants will do great, some crops will do great in a warmer environment,” said Kevin Kloesel, lead author of the report's chapter on Kansas, Oklahoma and Texas. “And then some won’t. The report predicts that if people do not adapt to or mitigate the risks associated with climate change, agricultural production will decrease, commodity prices will rise and human health, especially among the elderly, will suffer. While Kansans are already adapting to some of the changes brought on by climate change, Kloesel said it’s mostly reactionary. To have a greater impact, the report suggests individuals and communities need to make decisions based on possible future scenarios and do what they can now to limit greenhouse gas emissions.